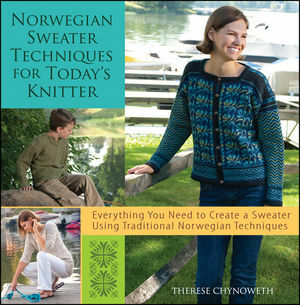 I’ve been looking forward to getting my hands on “Norwegian Sweater Techniques for Today’s Knitter” by the wonderful Therese Chynoweth. At last, it made its merry way to my desk last week. What a treat! I’m so delighted by this book! But, I knew I would be. As some of you may know, Therese was the yarn director at Dale of Norway US for several years. While there, she wore many hats: editing patterns, marketing yarn, teaching classes and, somehow, even finding time for some of her own designing. Over the years, I got to know her as the sure-bet lifeline I’d call upon whenever any thorny Dale pattern questions arose. Usually, she knew the precise answer off the top of her head. When that wasn’t an option, she had the most practical work-around at her fingertips. When a new approach was required, she could explain every detail of any needed technique brilliantly. And in great humor. So, it comes as no surprise that her book is a lovely, invaluable guide for any knitter interested in learning the elegant-yet-practical details behind the Norwegian knitting techniques that helped to make Dale sweaters famous. All of the designs in the book feature some use of “cutting stitches”, as Norwegians tend to refer to them, or steeks, as they’re typically (albeit not officially) known. I love that they’re all displayed together in little thumbnails in the front, for a quick, one-glance reference. (Why don’t more books offer that?!) Dale aficionados will be happy to learn that “Norwegian Sweater Techniques for Today’s Knitter” includes three designs that are updated versions of some old Dale of Norway beauties. The rest are Therese Chynoweth originals. There are about 100 helpful little “action shots” illustrating the steps taken in knitting Therese’s projects. Twenty designs in all are included – mostly ladies’ sweaters, but several nice things for men and kids, too. You’ll also see a pillow, a purse and even a shawl. Yes, a steeked shawl! It’s great that Therese has included some of these smaller projects, for they’re the perfect way for beginners to get their feet wet with some of these techniques, while still being appealing quick gift projects for the pros. Only seven of her designs feature colorwork, which I thought, at first, was surprising for a book so centered around the sew-and-cut approach. But, it’s also very interesting to see how Therese broadens the use of steeks into some lovely, single-colored, modern silhouettes. Whether a knitter favors colorwork, textures, cables, lace or plain old stockinette, there are projects in this book to show anyone how to beautifully (and sensibly) take scissors to knitting. This entry was posted in Knitting, Miscellaneous, Technique, Uncategorized and tagged "book review", "knitting techniques", chynoweth, Dale of Norway, finishing, finishing techniques, Knitting, knitting patterns, Norwegian knitting, steek, therese. Bookmark the permalink. great review! looking forward to getting my hands on a copy.